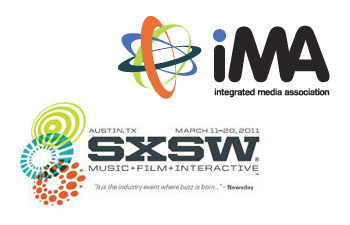 For the first time, the Integrated Media Association conference joined SXSWi, offering a public media track in the interactive festival. Public media makers found a whole new crew to hang with at this year’s Integrated Media Association (IMA) Conference on March 10 and 11. Fueling excitement was a new collaboration: The IMA preceded and then flowed into the interactive track of the SXSW festival on the 12th. Attendees at a Knight Foundation-supported array of SXSWi panels on news innovation and content strategy joined the mix. Despite looming cuts and recent controversies, participants seemed eager both to learn about a raft of recent public media experiments and collaborations, and to meet their online friends and followers in the flesh. This annual public media conference, IMA, has recently been revitalized with new leadership and strategy, and felt much hipper and more cohesive than the last iteration of the conference in 2009. But don’t just take my word for it. Here’s a glimpse at the conversations through the eyes of attendees — noted in bold — and my own running Twitter coverage at @beyondbroadcast. You can follow a larger discussion of both conferences by going to the #imaconf and #sxsw hashtags on Twitter. Geez — pack for IMA or glue myself to the screen to track blowback on Schiller’s resignation? #pubmedia, I can’t keep up! @nextgenradio (Doug Mitchell) : @beyondbroadcast Plenty to talk about amongst the faithful at SXSWi. Leaving today for Austin. PBS incubation lab is building directory of station tech staff for collab projects. At #iMAConf, #pubcorps is announcing “America’s Next Top Public Media Model” contest. Learn more about these Top Model projects and the Kindred collaboration platform at publicmediacorps.org. Is Tim Olson IMA’s next top model? @kookster: Mobile is not as forgiving; you have to think about every pixel and what the user is seeing. @kookster: variability of both networks and devices makes mobile development trickier than web by an order of magnitude. @MediaFunders: Is it enough 4 public media 2 ask content makers to preformed mold? How can public truly enter the space? 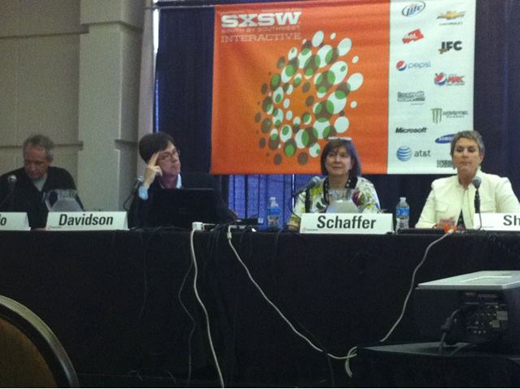 Back at #SXSW — at a panel on new models in #pubmedia, with Orlando Bagwell, Sue Schardt, Jacquie Jones and Greg Pak. How to innovate? Bagwell: How to reinvent public service for a multiplatform environment? Jones: Began by supporting diverse producers, but then realized #pubmedia wasn’t reaching minority audiences; how to create relationship? Jones: realized there was no dedicated producer corps within #pubmedia creating content relevant to minority communities — how to address? 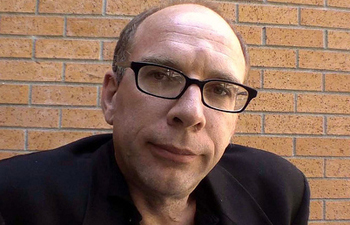 @jayrosen_nyu: the “fantasy of replacement” is a phantom of journalists’ fears re. waning business model. @jayrosen_nyu: if it were self-evident that commercial model is better, drawing contrasts w/bloggers would be uneccessary, yes? Editors’ note: Read Jay Rosen’s discussion of the attempts to defund public media. 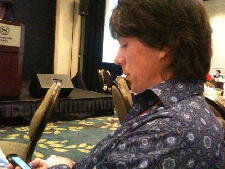 @CJERICSON: Video or audio of #imaconf coming soon. Audio this weekend. Video next week. For all attendees & members. @g5member: Great to meet so many of public media’s creative and dedicated minds at #imaconf. Now, #sxsw time! Full disclosure: In my role as the director of the Ford Foundation-funded Future of Public Media Project, I am working with the National Black Programing Consortium to incubate their Public Media Corps project via the Center for Social Media, and have also worked with PBS/NPR on the PubCamps and Association of Independents in Radio on a study of their MQ2 project. More details on all of these here: futureofpublicmedia.net. CORRECTION: One of the tweets above has been corrected to reflect that it was blogger Latoya Peterson — not singer Latoya Jackson — who participated in the Public Media Corps judging panel for the next Top Public Media Model. Apologies! Jessica Clark directs the Future of Public Media Project at American University’s Center for Social Media, and is a Knight Media Policy Fellow at the New America Foundation.